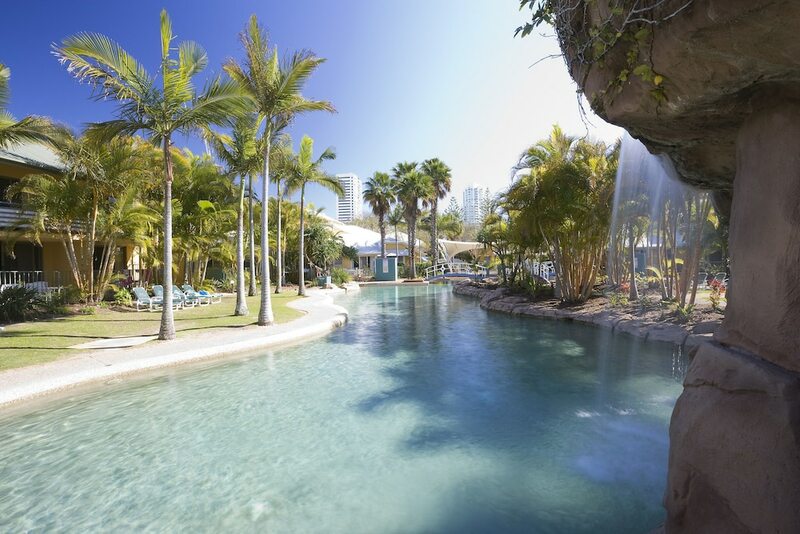 When you stay at BreakFree Diamond Beach in Mermaid Beach, you'll be near the beach, within a 15-minute walk of Pacific Fair Shopping Centre and The Star Gold Coast. This 4-star aparthotel is 0.3 mi (0.5 km) from Kurrawa Beach and 0.6 mi (1 km) from The Oasis. Make yourself at home in one of the 87 guestrooms, featuring kitchens with refrigerators and microwaves. Rooms have private patios. Flat-screen televisions with cable programming provide entertainment, while wireless Internet access (surcharge) keeps you connected. Conveniences include safes and desks, and housekeeping is provided weekly. Take advantage of recreation opportunities such as a spa tub, or other amenities including complimentary wireless Internet access and babysitting/childcare (surcharge). This aparthotel also features an arcade/game room, gift shops/newsstands, and tour/ticket assistance. Featured amenities include limo/town car service, dry cleaning/laundry services, and luggage storage. Free self parking is available onsite. BreakFree Diamond Beach features 2 outdoor swimming pools, a spa tub, and a children's pool. Public areas are equipped with complimentary wireless Internet access. This family-friendly aparthotel also offers tour/ticket assistance, barbecue grills, and an arcade/game room. Complimentary self parking is available on site. BreakFree Diamond Beach is a smoke-free property. 2 outdoor swimming pools are on site along with a children's pool. Other recreational amenities include a spa tub. Guests arriving outside regular reception hours must press #9 on the intercom system to check-in. For more details, please contact the property using the information on the reservation confirmation received after booking.